Airline fees seem to grow more intrusive every year -- it's tough to keep up with all the changes in costs and in policies. Fees for additional bags -- or bags that are too heavy -- are but two examples of costs you can avoid. To be sure, there are some that can't be sidestepped: departure taxes, change fees when plans go awry and those awful fees to redeem frequent flier miles. But there are several fees you can and should always avoid. Pursue the elimination of these with as much vigor as you pursue cheap airline tickets and your budget will benefit greatly. Most airlines still allow two carry-on pieces (one carry-on and one "personal" item -- handbag, etc. 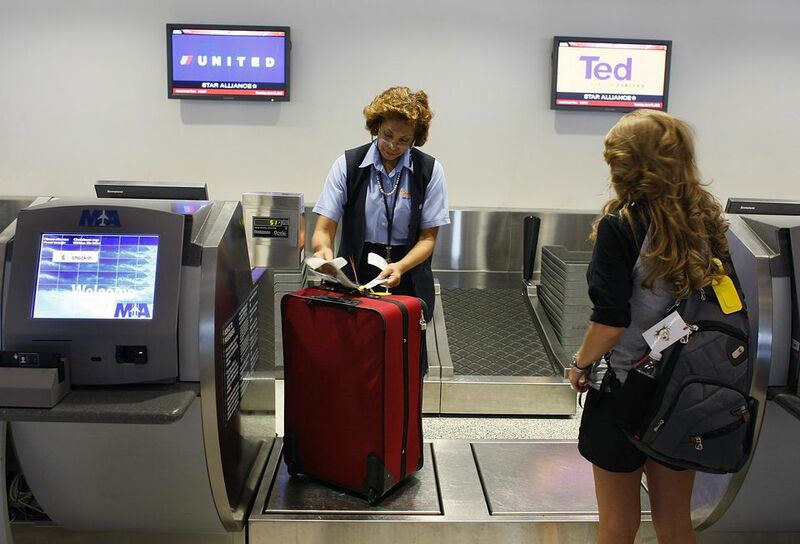 ), but virtually every airline now charges a fee for checked bags. that the marketing folks at Southwest Airlines have made their no-fee policy the centerpiece of their marketing efforts. Budget travelers who can't operate on a one-bag carry-on travel policy should be aware of whatever the airline is charging that day and plan accordingly. Don't be surprised at the airport, and don't let checked baggage fees defeat your budget airfare strategies. Travelers who lug too much along with them face two possible fees: one for checked baggage, and another for oversized or overweight items. Most airlines have a fee structure buried deep in their website map complete with measurements and weights that cannot be exceeded and the penalties for such excess. If you must take something heavy and oversized, ask yourself how essential it will become at your destination. Can you rent skis, surfboards or golf clubs for less than what it will cost to bring your own? Many times, the answer is yes. If you're paying these fees on a regular basis, it might be time to re-evaluate the way you approach packing. Find out more about packing properly for a budget trip. Many carriers, especially budget airlines, are charging for services rendered by phone or by personnel at the airport. For efficiency's sake, they want customers to use online services that don't require as many employees. Here's a case where you can help the airlines become more efficient and save yourself money at the same time. Whenever possible, book online and save money on these service surcharges. There are times when you'll have to use an operator's assistance, but on most routine bookings, you can finish the work yourself with a few clicks. If you have a debit or credit card and the willingness to part with some cash, you can watch an in-flight movie on a number of airlines. To be fair, these same carriers frequently offer very low fares and subscribe to a policy of only making you pay for what you use. That keeps costs down, but if you're a frequent flier who loves watching movies on a plane, the cost can add up quickly. It could be better to invest in an inexpensive (about $100) and portable DVD player, which will pay for itself soon enough after you watch a few flicks. Fortunately, there is a wide selection of players available at relatively low cost. Also, many travelers now use their laptops or even their hand-held devices to play movies. Just be sure not to fire it up until the crew gives the go-ahead. One airline has been known to charge $2 for a small bag of carrots. Potato chips and other snack items can be $5 or more on some flights. Some airlines have cleverly packaged these snacks so that you can't buy just one, which allows the cost to increase to what a meal might set you back in a modest restaurant. A similar problem exists in most hotels, where in-room honor bars dispense overpriced drinks and edibles. Some people buy snacks to stash in carry-on bags. If you wait until arriving at the airport, you'll pay quite a bit more than at your local grocery store. Either way, let the airlines sell overpriced snacks to people who don't mind paying for what was once a convenience provided free of charge. In the early days of air travel, carriers seemed intent on making passengers as comfortable as possible. Today, that comfort comes at a price on many airlines. The primary motivation for anything on a plane these days appears to be revenue potential rather than passenger comfort. Citing financial stresses, airlines are looking at any way to generate cash. Need a pillow or blanket? Most airlines have stooped to charging passengers for these basic amenities. None of these charges will sink your travel budget. But somewhere, a line needs to be drawn that shows airlines there are limits. If you can do without a pillow or blanket, send a message the airlines need to hear loudly and frequently. This is an area of uncertainty for the airlines. No one is quite sure whether they should spend the money to offer Wi-Fi because consumers are frequently unwilling to pay the fees. How much, if anything, are you willing to pay? Those on expense accounts who have work to do are likely to pay and turn in their receipts for reimbursement. The rest of us can do without the Internet for a few hours. How about bringing along a good book instead? Fees for bringing your favorite pet aboard are on the rise. Charges of $125 to $200 USD are now the baseline cost, and frequently the final tab goes much higher depending upon your animal's size and breed. Much like baggage fee schedules, travelers must dig deeply into the site maps of their favorite airlines to find these pet fees. For some, this particular charge might fit into the "unavoidable" category. If that describes your situation, at least look at other options for getting your pet to the prescribed location. This fee is nothing new -- airlines have been charging extra for alcoholic beverages for quite some time. Those small bottles usually come at a large price on an airplane. We all know some will overindulge. Reports of unruly passengers and the occasional diverted flights they prompt are relatively infrequent. But it would take quite a few problems before the airlines revise these policies on alcohol, as it's yet another attractive revenue stream. In fact, many carriers have made it easier for passengers to imbibe by providing credit card payment options right at your seat. If you do choose to indulge, take note that in-flight alcohol consumption will also contribute to the effects of jet lag on long haul flights.